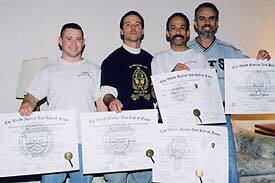 20x Hall of Fame Inductee by 16 different Martial Arts Associations. A wrestler turned martial artist, Grandmaster Jody Perry knows first-hand how valuable cross training is for wrestlers, grapplers and martial artists. In search of a winning edge to secure an Olympic berth on the 1980, '84 and '88 Olympic Greco-Roman Wrestling team, Grandmaster Perry competed in the nationals in Freestyle and Greco-Roman wrestling, Judo and Sambo. 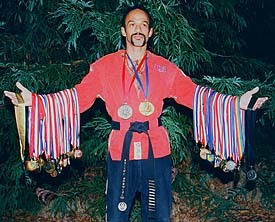 Grandmaster Perry with some of the medals he has won in competition. In Sambo, he is a former World Champion, and eight-time gold medal holder, and was the Sambo World Team coach in 1998. He also holds a national title in Judo. He has studied multiple martial arts including Gracie Jiu Jitsu from Relson Gracie, Aikido, and Wing Chun, and is active in promoting Sport Jujutsu. He holds black belts in Judo, Panjitsu, and Sambo. Grandmaster Perry is the founder of the officially recognized martial arts style Perry's Full Circle (PFC), and has also spent many years teaching self-defense through Model Mugging and working with youth groups and battered women's shelters. 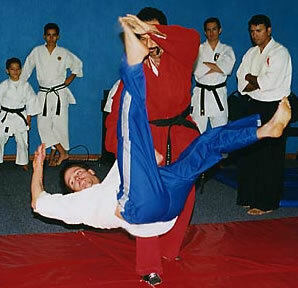 He also teaches regular curriculum courses in martial arts and self-defense at Sonoma State University. To date Grandmaster Perry has received 12 Hall of Fame awards from 10 separate martial arts associations, including the Hawaiian Martial Arts Association, the World Martial Arts Hall of Fame, the International Jujitsu Association, and Action Martial Arts Magazine. (left to right) PFC black belt Adam Hutchins, Sensei Jay Perry, Grandmaster Jody Perry and PFC black belt Carmen Bottiglieri hold Grandmaster Perry's certificates from the World Martial Arts Hall of Fame. He is a certified International Pankration referee, and actively promotes Mixed Martial arts, Pankration and Sambo in seminars and demonstrations given throughout North America.